I came across this awesome map of the Internet recently which is quite simply, amazing. 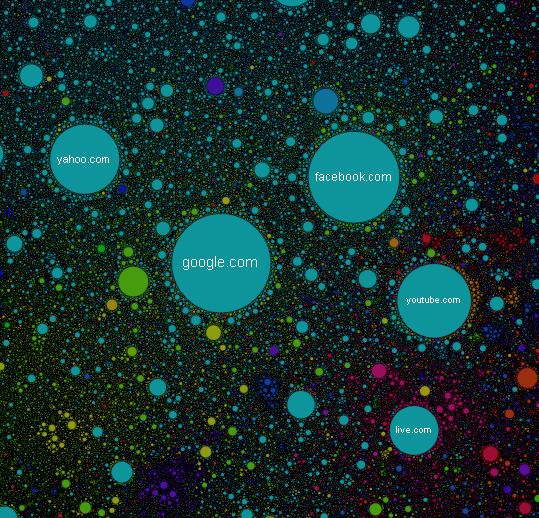 Firstly each website is represented by a bubble. The size of each bubble is determined by the number of hits that it receives, whereas the proximity of each bubble is determined by the amount of traffic between sites. The colour of the bubbles also represent the countries they belong to. This reminds me of a similar map of the internet created back in 2006 by XKCD. The map displayed all the possible IP addresses (IPv4) and who reserved each IP address space. XKCD also made two other ‘maps’ of the internet that are worth a mention: Online Communities and Online Communities 2. Categories: Mathematics, Uncategorized | Permalink.